Even academically trained historians are apt, however unconsciously, to see the events of the fourteenth century phases of the Hundred Years War through the eyes of chroniclers like Froissart. His almost cinematic mix of observation, editing of messy realities and sometimes downright invention- all done in the bright colours of manuscript illumination- still works powerfully over the centuries to influence modern views of his age. It is all too easy to be swept up in the power of his narration and to unconsciously accept his world view, which all too easily cast a veil of chivalric glamour over the deeds of violent thugs. He mixed easily with routiers and tends to present the world through their eyes. In this telling the towns and cities of France- especially the lands to the north and east of the English-held Duchy of Guyenne- exist primarily to be looted and ransomed. The possibility that the non-chivalrous inhabitants of these places might have effective ways of defending themselves hardly figures on his pages. Nicolas Savy’s analysis of how the towns in a region extending from Montferrand to Bergerac and Agen to Montpellier armed themselves to deal with the crisis unleashed by the wars of France and England and their local ramifications provides a welcome corrective to a view of the world as seen from the back of a routier’s horse. Based on comprehensive analysis of material in accounting records and town council deliberations from across the area, this tells a story of community organisation in self-defence. While citizens were encouraged to arm themselves with basic weaponry and protective gear, the primary weapon involved was the crossbow in all its variants, large and small. The objective was to keep attackers at long range where their superior skills in hand to hand combat could be minimised. A kind of mixed economy of defence developed, with town councils engaging in direct procurement of weapons and ammunition (sometimes in massive quantities) while encouraging the better off inhabitants to acquire their own kit as well. Some places put specialist crossbow makers on the town payroll to ensure that the town arsenal remained functional (crossbows require a good deal of ongoing maintenance to retain their effectiveness over time) or encouraged them to move in with favourable tax deals and local monopolies. Despite these privileges, Savy also detects a process of technology transfer whereby local artisans became increasingly able to undertake at least basic maintenance functions or turn their hands to making components for the bows and their ammunition. By the end of the period, he suggests, the towns he examines had a great deal more weapons in private hands than they had at its start though, perhaps surprisingly, this does not seem to have had much effect on the level of violent crime. The towns also invested heavily in artillery. Gunpowder weapons- mostly fairly small calibre iron cannons- appear quite early and were mounted on the walls. They were supplemented by sometimes massive and very expensive trebuchets and other counterweight engines. These required substantial investment, usually needed a skilled specialist engineer to set them up, took a lot of maintenance and needed a numerous crew to operate them. They might be lent to royal lieutenants setting a siege in the region but in defensive mode they seem to have had to shoot “blind” from a fixed site within town walls. I found myself wondering wonder whether they might have become prestige items, acquired as much in a spirit of inter-town one upmanship as because they were crucial to an effective defence strategy. The various weapons systems, supplemented by slingshots, noxious liquids and plain heavy rocks, were integrated into sophisticated defence planning based on town walls. Again the objective was to open up clear fields of fire and channel attackers into killing zones which they would have to traverse in order to assault the walls while not entirely giving up suburbs which had developed round the fortified urban core over the years. While no town in the region seems to have embarked on comprehensive re-fortification on an expanded ground plan in this period, considerable investment went into barbicans, supplementary palisades in the ditches to impede attackers and wooden turrets known locally as gachiels which provided an improved field of fire along the base of the walls. The defensive remodeling beyond the core walls could be a complex and labour-intensive affair with considerable environmental consequences (large scale tree felling), a significant impact on day-to-day communications (roads diverted, bridges broken or reoriented) and on the suburban fabric (buildings demolished, streets realigned). The long term consequences can be seen in the built environment of towns like Cahors and Rodez to the present day. Savy makes a strong case for the coherence and effectiveness of urban defence measures in his chosen region. At times his exposition seems a little idealised- how things were supposed to happen if everything went according to plan rather than what really did happen in a moment of crisis. The possibility that urban self-defence measures might be complicated by the presence of a royal garrison with its own leadership and possibly divergent priorities is barely mentioned. His account is also much stronger on weapons and the people who made and maintained them (the section on procurement and the local economy of arms production is particularly valuable) than on those who used them. It is, for instance, clear that small numbers of crossbowmen might be sent off to serve in royal armies at times of regional mobilisation. Did the same men go every time the call was made and if so how were they chosen? 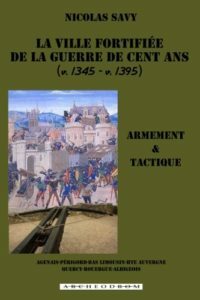 While there is some evidence for the establishment of shooting ranges, there do not appear to have been anything equivalent to the crossbow shooting companies in Flanders and northern France recently studied by Laura Crombie- and certainly nothing to match the culture of inter-town competitions which she analysed so fruitfully. One wonders why not. The long term impact of defence costs on town budgets and governance remains shadowy. Savy suggests that the burden of procuring arms and keeping defences in good order could be very substantial and represented a high percentage of urban budgets. Just how sustainable were these costs, even if (as he also suggests) some of them tended to diminish over time as urban society became increasingly tooled up for war? These are however points for future consideration. Savy’s work valuably diverts historical attention away from the colourful predators who have tended to absorb most attention towards their potential targets- and to remind us that the townspeople of late medieval France were anything but passive victims of routier aggression.